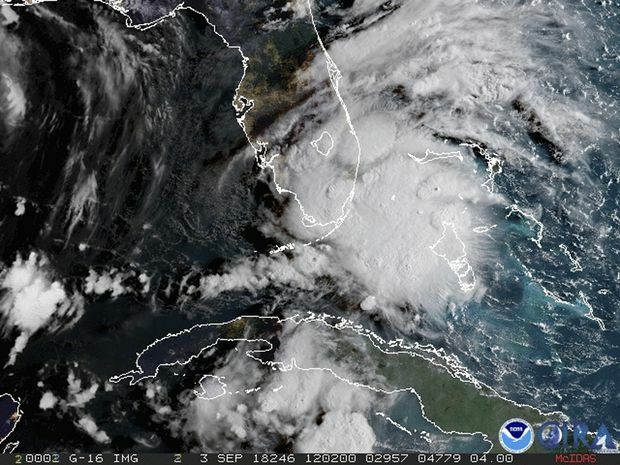 In this image released by NOAA's GOES-16 on Sept. 3, 2018, Tropical Storm Gordon appears south of Florida. Tropical Storm Gordon whipped the southern tip of Florida with high winds and rain on Monday, and was expected to make landfall as a hurricane along the central U.S. Gulf Coast on Tuesday night, the National Hurricane Center (NHC) said. The storm was forecast to come ashore late on Tuesday near the border between Louisiana and Mississippi, and drop as much as 20 centimetres of rain in some areas of the U.S. South still reeling from hurricanes a year ago. Louisiana Gov. John Bel Edwards declared a state of emergency, saying 200 Louisiana National Guardsmen were being deployed, along with 63 high-water trucks, 39 boats, and 4 helicopters. The Mississippi Emergency Management Agency warned of storm surges of between 1-1.5 metres and told South Mississippi residents to be prepared to evacuate. Gordon was generating winds of 80 km/h on Monday as it steamed west-northwest at 27 km/h, the National Hurricane Center said. By Monday afternoon, the storm had passed over Florida’s southern tip. There were no reports of any injuries or deaths or any damages to buildings, said Alberto Moscoso, a spokesman for the Florida Division of Emergency Management. At the mouth of the Mississippi River, around the area of New Orleans, the storm could generate a surge of up to 1.2 metres and smaller surges could hit coastland along other parts of the Gulf Coast, the Miami-based hurricane center said. U.S. oil producer Anadarko Petroleum Corp on Monday evacuated workers and shut production at two offshore oil platforms, and other companies with production and refining operations along the Gulf Coast said they were securing facilities. The U.S. Coast Guard also warned that the ports of New Orleans as well as Gulfport and Pascagoula, Mississippi, may have to close within 48 hours when gale force winds from Gordon are expected to arrive.